We luckily have spring on our side right now. Temperatures are up again and some even started the BBQ season. My balcony is not yet ready for bbq-ing but my fridge definitely is. When planning my weekend lunches ahead I usually also check the weather forecast. Today I was in the mood for a savory tart. I went for a French classic; quiche lorraine and needed a more funky salad to go with. As the flavors of the quiche are rather neutral I wanted to bring in some daring combinations as a side dish. While browsing the other day I found a similar recipe, which I chose to adapt according to my preferences. In terms of vinegar I dared to put a little extra to it. But you'll find out later on. 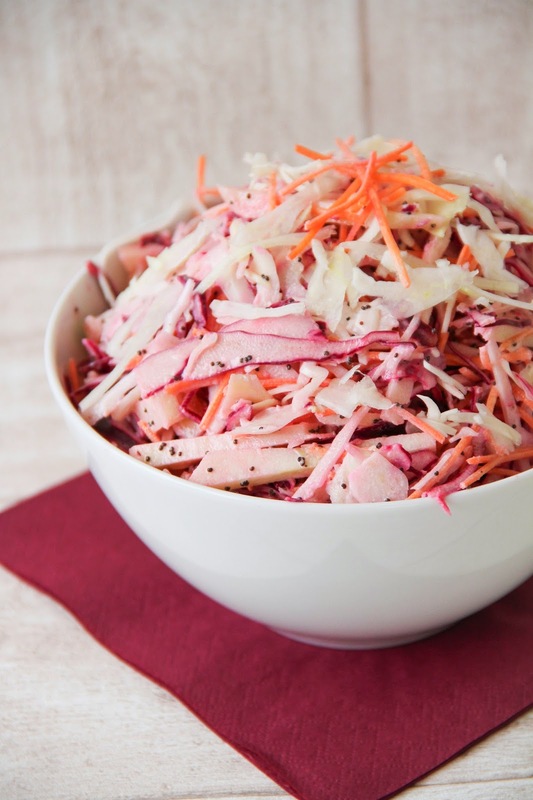 Coleslaw is one of my favorite salads. I remember that on summer nights my mom sometimes prepared savory tarts with coleslaw as a side. 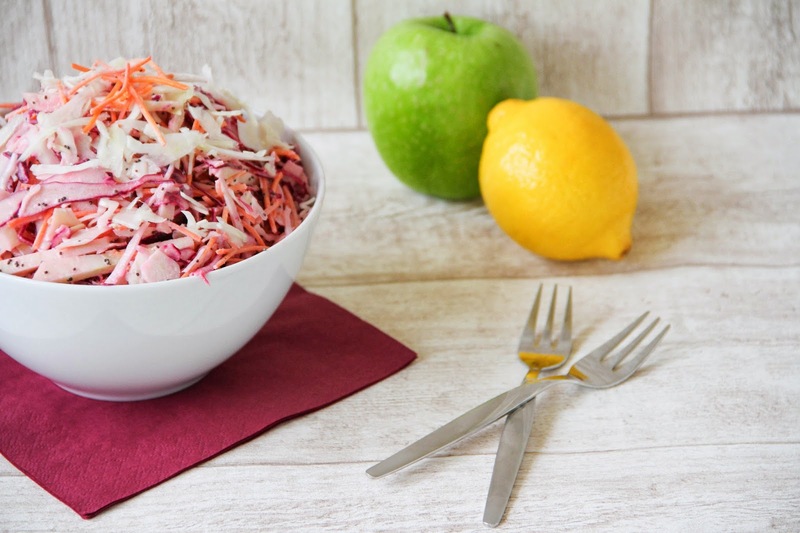 But it was always the classic coleslaw. So yet again I share with you another childhood classic; a savory one this time. Over the years I already tried several recipes, but let me give you one good advice. 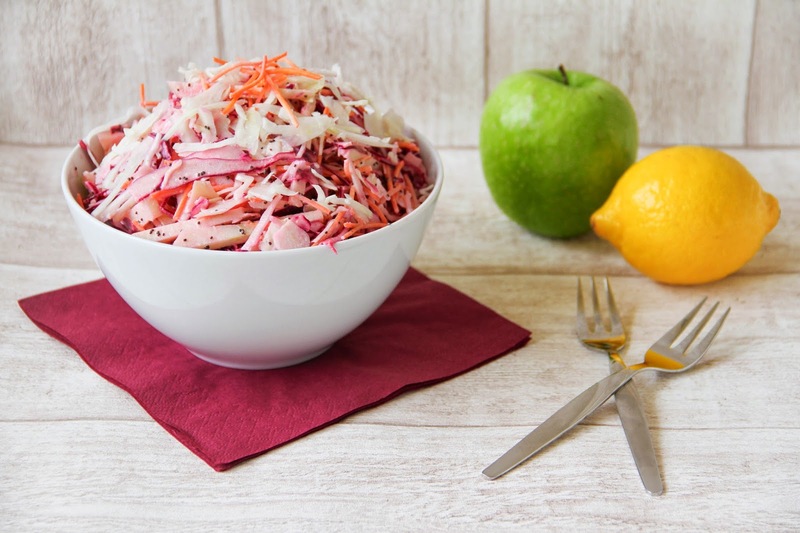 The secret of a good coleslaw lies in the mayonnaise you choose. A good quality mayonnaise, or even better a home made one, is the key to success. 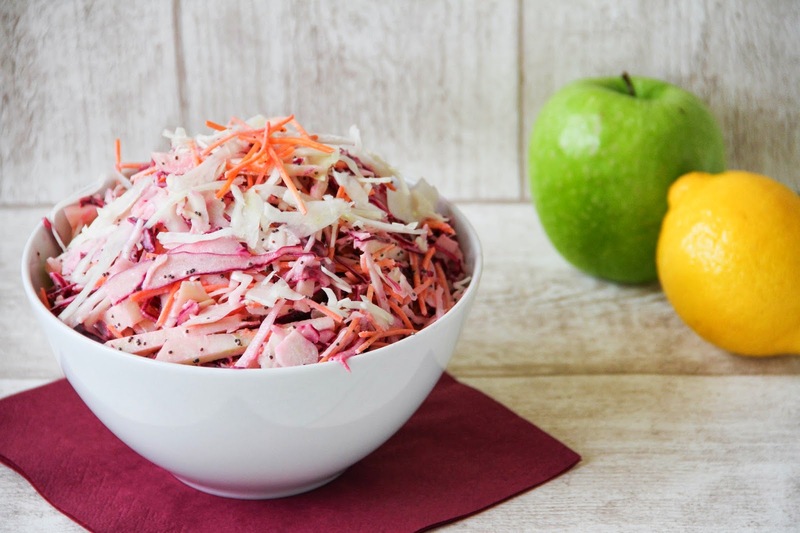 Apples give your salad a little extra and are a good counterweight to the cabbages' acidity. 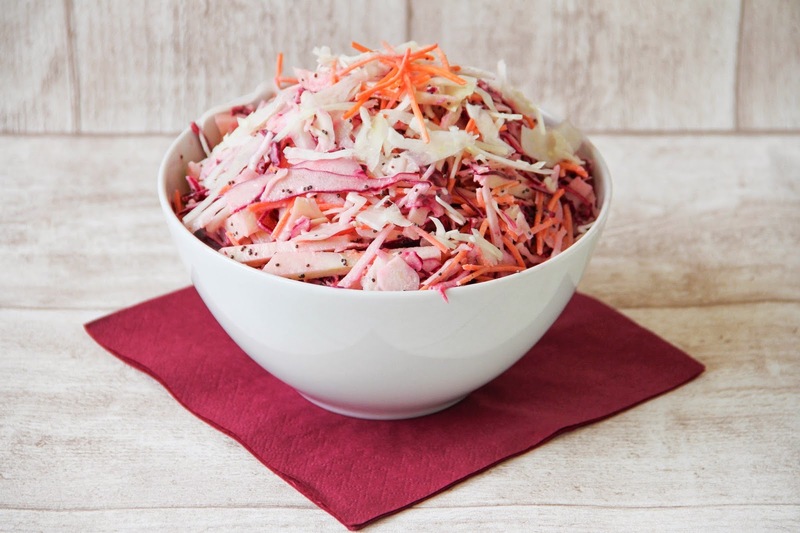 Whisk together the shredded cabbages and the grated carrots. Cut the apple into small slices and add to the vegetables. In a small bowl mix the olive oil, vinegar, mayonnaise until you get a homogenous vinaigrette. Add the poppy seed and the juice of one lemon and whisk again. Pour the vinaigrette over the vegetables and stir with a spatula until salad and sauce are well combined. Cover the bowl with cling film and refrigerate for at least one hour.